Dozens Dead After Iraq's Bloodiest Day This Year : The Two-Way A series of apparently coordinated attacks in at least 13 cities also injured hundreds of people. In Baghdad's Sadr City district, the view through a vehicle that was destroyed in one of today's attacks. 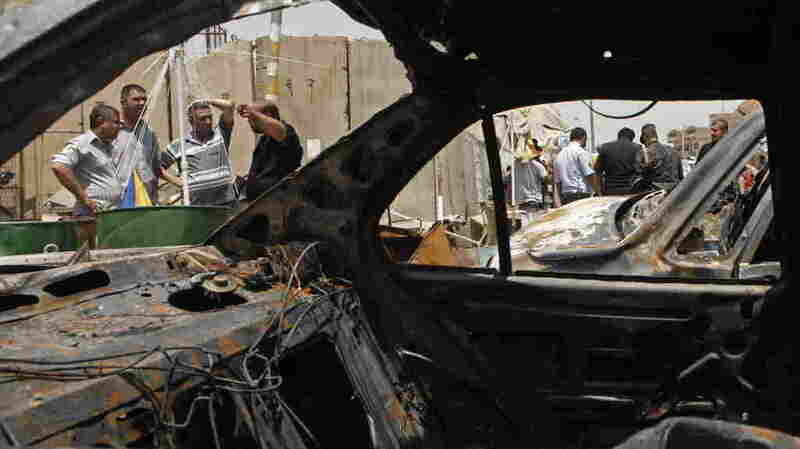 The death toll keeps rising and is now said to be around 100 after a series of bombings and shootings today in Iraq. More than 200 people were wounded in what appear to have been coordinated attacks in at least 13 cities. According to The Associated Press, it has been that nation's "deadliest day so far this year." Reuters writes that the attacks "pointed up the deficiencies of the Iraqi security forces, which failed to prevent insurgents from striking in multiple locations across the country." It is reporting that "as well as the scores of deaths, at least 268 people were wounded by bombings and shootings in Shiite areas of Baghdad, the Shi'ite town of Taji to the north, the northern cities of Kirkuk and Mosul and many other places, hospital and police sources said." The Wall Street Journal says the attacks came after "an al-Qaida-linked militant group issued a fresh threat against Baghdad's Shiite-led government." According to the BBC, "most of those killed were security forces — who appear to have been a prime target, correspondents say." From Baghdad, though, correspondent Ghassa Adnan tells our Newscast Desk that several of the bombs went off in markets, "killing and injuring many shoppers."